It is as described on the site; and the cabinet is very nice. The only downside I have is the 2 refrigerators have "Wine Enthusiast" written on the front of them; and it makes it look cheap and tacky. 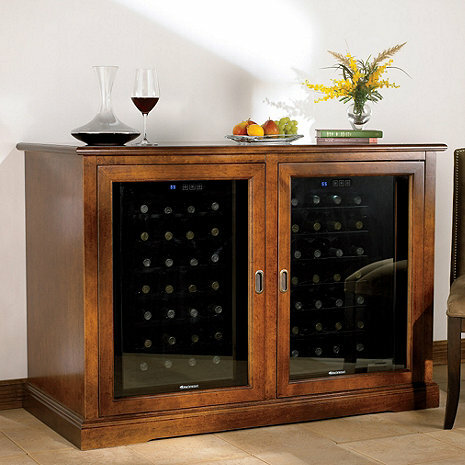 I have only kudos for the cabinet and the wine refrigerators. I am surprised how quiet they are and how they are maintaining 57 degrees! It works Great and looks Beautiful. The Refrigerator units function perfectly and quietly. Arrived quickly and delivery was great. The cabinet is absolutely beautiful. We are disappointed in the wine coolers that came with it. The lowest temp you can set is 52 degrees which is a bit warm for our white wines. I was told this is for wine storage and not wine service. I think that this is a bit ridiculous since the accompanying lit tells recommends white wines be between 45 & 52 degrees. First, the set up looks good, and works well. Also, I am very satisfied that I bought it. Now the details: delivery was painful. I wish I could attach photos because it would be priceless watching the delivery company moving a 300lb box saying "this end up" and bringing it in upside down. The movers then said where do you want it....white glove? I think not. Once I told them they were supposed to unpack it, they agreed. This unit needs the owner to remove the backing (better have an electric drill and the appropriate bit ready) because they are going to want to delivery and dash! The driver was sympathetic and had to fight his boss (I could hear him talk on speaker). The boss wanted him to dump and run. Interesting that I paid an extra $150 for an extra worker because I have 8 steps into my home, and no extra worker was present. Again the shipping company was the problem. All arrived ok with no blemishes and the driver did wait for me to take the back off and helped put the cooling units into the cabinet. Bottom line: good product, questionable delivery company in the Charlotte area. Looks Great! Italian workmanship is stunning !! Love it....and the fact that it was a gift to me from mom and dad make it even better......smiley face ! !